As the “big three” increasingly pursue their own narrowly defined national interests, however, other EU member states are emerging as leaders in key foreign-policy fields. For example, Sweden – the 14th largest member state in terms of population, and eighth in terms of GDP – under the leadership of Prime Minister Fredrik Reinfeldt and Foreign Minister Carl Bildt punches considerably above its weight. Last year, it increased annual aid to North Africa by SEK100 million (€11.1 million), proposed an EU mission to Tunisia just a week after the revolution to support democratic aspirations there, and was an early and strong backer of UN resolutions in support of the uprising in Libya. Poland, too, is emerging as a foreign-policy leader. Prime Minister Donald Tusk and Foreign Minister Radek Sikorski have particularly taken the initiative on the EU’s strategy towards Russia, where Poland has largely overcome its differences with Germany and is now at the forefront of efforts to develop a genuinely comprehensive approach. Poland has also led on European defense (though it declined to take part in the military intervention in Libya). 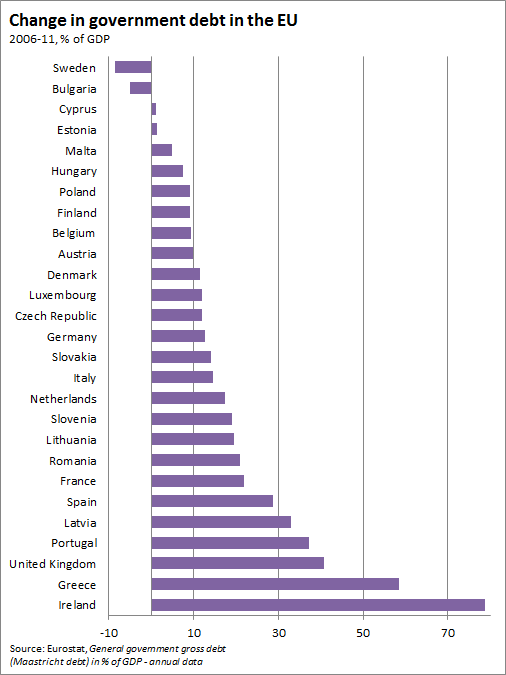 This reflects the strength of the Polish economy, which is expected to grow by more than 3% in 2012 – faster than almost anywhere else in the EU. It strikes this blogger that the projections in the figure posted earlier today might not seem like a big deal. From sixty-something to fifty-something in share of total population in working-age. Why would it matter? Well, it does matter. A lot. The fifty-something needs to be put in relation to the sixty-something. If there are six persons working in a company and one quits without being replaced the company loses one-sixth of its total workforce. That is a lot. And if the company in question needs to provide pension and other benefits to the sixth person, this will lead to great pressure on the remaining five workers. This is what happens when the workforce vanishes simultaneously as the ratio of people who do work divided by the people who do not work diminishes. Now multiply this problem by one hundred million and you have a rough idea of where Europe is expected to be heading in the coming decades. So here is another version of the figure that shows the projections in percent relative to year 2010. It shows the pressures demography will put on the working-age population as they will in the future be 15% fewer in relation to the total population. Much fewer workers per non-working person, harshly speaking. And the size of the total workforce will decline by more than 20%. Is there anybody who thinks that the debts caused by 500 million people in working-age will be easier to repay when that number falls to 400 million? It is popular to talk about peaks, such as peak oil – the point in time when the maximum rate of global petroleum extraction is reached. But there is one important peak that there has been surprisingly little discussion about. That is peak workforce. Demography has profound effects on the economy. As The Economist’s Buttonwood columnist importantly points out, a smaller workforce in absolute numbers will make the huge nominal government debts of today much harder to repay. Sluggish nominal GDP growth due to a diminishing labour force will not reduce nominal debt. And as this blog argued the other day, the ratio of the total population who are in working-age, and thus capable to work, affects the possibility to provide for those who cannot or do not work. Based on historical data for the past six decades years and based on projected data for the next six decades in Europe, it turns out that we, at the moment, seem to live in the best time of our lives, with respect to these demographic parameters. 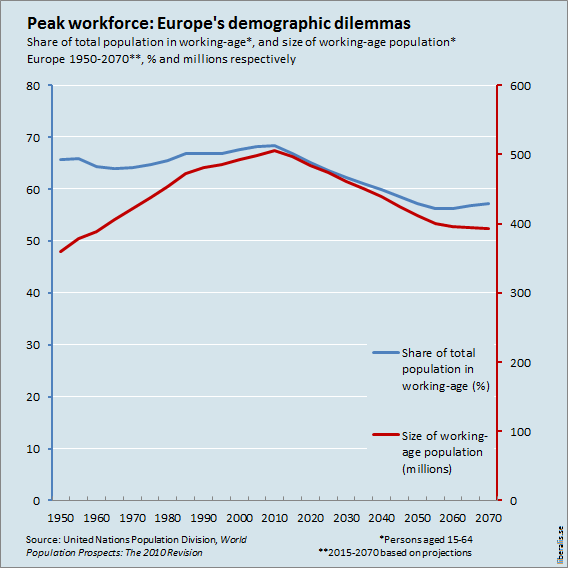 Europe will not in the future see a workforce as large as the one today, and we are set to see a diminishing share of the population who are in working-age. If the projections are correct, the smaller labour force could have severe negative effects for all the European countries that are now heavily indebted. 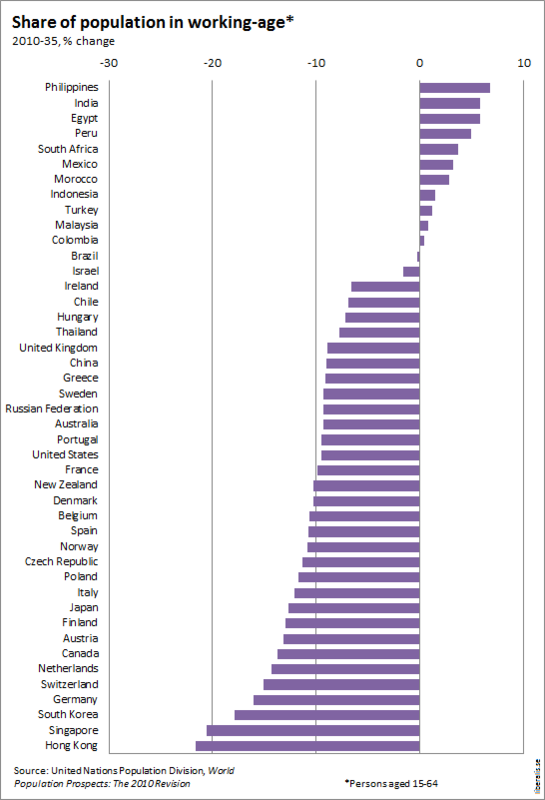 As stated, fewer people in working-age do not bode well for nominal GDP growth. Furthermore, the projected decrease in the share of the total population who are in working-age implies that, in the coming decades, the people who do work will have to work longer or more productively to provide for the growing share of people who do not work. 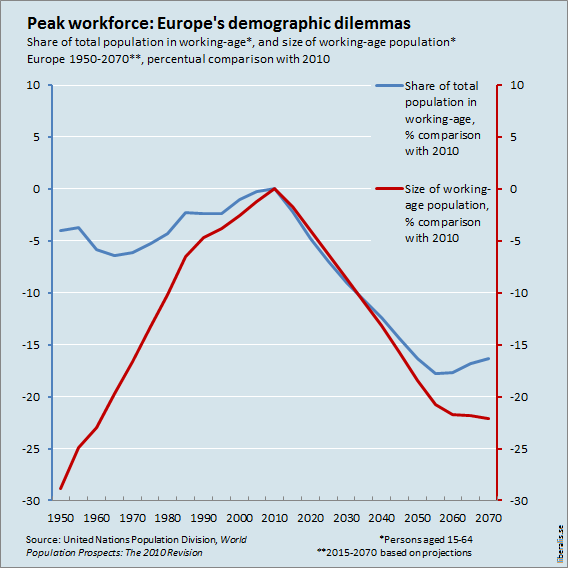 These demographic dilemmas pose a very relevant question: How should Europe afford the future? After being inspired by a blog post by The Economist’s Buttonwood correspondent, I drew the following graph. Too big to fail – Is big a beauty or a beast? When former IMF Chief Economist Simon Johnson travels around the United States making excellent presentations about the too-big-to-fail problem, he talks about the problem posed by the fact that the six largest American banks have total assets worth about 60 percent of national GDP. The following graph shows the current situation in Sweden. All data has been gathered from respective annual reports. Football losses and violence at home: is there a connection? A study finds that upset losses in the National Football League (NFL) – defined as defeats when the home team was predicted to win by four or more points – lead to a 10% increase in the rate of at-home violence by men against their wives and girlfriends (David Card and Gordon B. Dahl (2011) “Family Violence and Football: The Effect of Unexpected Emotional Cues on Violent Behavior,” The Quarterly Journal of Economics, 126 (1): pp. 103-143). Card and Dahl aim to contribute to the literature regarding media impact on violence and women’s well-being. Their argument goes that football games brings families together and “the emotional cues associated with televised games place women at an elevated risk of abuse”. A key factor in their study is the definition of “upset losses”, as contrary to “expected losses”. Whereas the latter has little or insignificant impact on violence, the former is found to lead to greater negative emotions and effects on violence.